Male fossas are 75?? ?80 cm (29?? ?31 in) long, plus a tail which is 70?? ?90 cm (27?? ?35 in) long. They weigh 6?? ?10 kg (13?? ?22 lb). Female fossas are 65?? ?70 cm (25?? ?27 in) with a similar-sized tail. They weigh 5?? ?7 kg (11?? ?15 lb). The fossa is a very agile animal. It can leap from tree to tree and display an agility similar to squirrels. The fossa is extremely cat-like in appearance and behaviour; it is often likened to the clouded leopard, a similar-sized felid native to southeast Asia. It is so cat-like, that it was originally classified as a member of the family Felidae. Recent observations indicate the fossa may not be as nocturnal as was once thought. The rarity of these animals likely contributed to the belief that fossa are entirely nocturnal, but recent scientific study has found that they are active both during the day and at night, depending on season and prey availability. One of the biomes hosting the fossa is the Madagascar dry deciduous forests. The best place to see fossa is in the Kirindy Forest, which is located about 70 km north of the city of Morondava. Baby fossas (pups) are born blind and toothless. They are dependent on their mother for about 1 year, and do not even leave the nest until they are four months old. Fossas do not breed until they are about four years old. 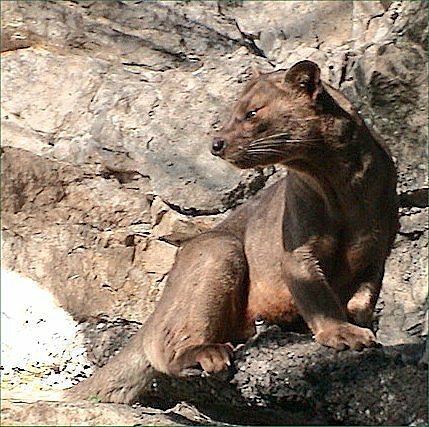 Fossas have been known to live 20 years in captivity. Though most still classify and accept that the fossa (along with its close relative the falanouc) is part of the family of viverrids, some have recently reclassified it in a new family of Malagasy civets and mongooses???Eupleridae. The fossa is a carnivore. It is a ferocious hunter that eats small to medium sized animals, from fish to birds, but is particularly adept at hunting lemurs, and is the predominant predator for many species, with only Madagascar's large snakes having any other significant predatory impact. Malagasy folklore often exaggerates the ferocity of the fossa, claiming that it will prey upon cattle, or even humans. The fossil record of Madagascar has yielded the remains of a giant prehistoric fossa (Cryptoprocta spelia), which was about 1.8 m (6 ft) long and weighed 90 kg (200 lb), making it the size of a leopard. This species was believed to have preyed upon the larger, ape-sized lemurs that inhabited Madagascar until the island was settled by man. Fossas have no natural predators, but may be consumed incidentally by the Nile crocodile. The fossa is only found on the island of Madagascar (like many other unique animals that have been found there). In , Luke Dollar (Mustelid, Viverrid & Procyonid Specialist Group) certified there were less than 2,500 mature individuals in fragmented areas in continuing decline. This certification earned the fossa the status of [[endangered species|Endangered] (EN ??? C2a) by the [IUCN|World Conservation Union] (IUCN). Previously, the fossa was listed as 'vulnerable'. The fossa is listed as a [Convention on the International Trade in Endangered Species of Wild Flora and Fauna] (CITES) Appendix II animal, which puts restrictions on its export and trade. Fossas were featured characters in the DreamWorks film Madagascar, in which they prey on the resident lemurs, who are terrified by the mere mention of them. They spelled the name of the animal as it is pronounced: Foosa.